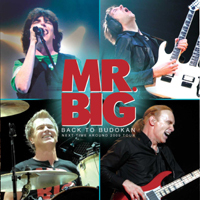 I saw MR. BIG perform in Aarhus, DK this month and the set list was more or less the same as the one on this double CD. Nice to be visually prepared as well! From the get-go the pace is set; strong musicianship and strong compositions. Just as we remember the radio-razing MR. BIG. But a lot has happened since the initial success of “Lean into It”. Various solo stints, Gilbert’s relocation to Japan, new line-up – you name it! It does however seem like they’re back for good. One gets the impression that these guys mean business and if you loved the bass/guitar duels, the girly vocals and even the ballads you’re guaranteed to find even more of that on this, their latest! Not really a new STUDIO album, but you know what I mean – you get the whole package! A sum-up of everything the band ever stood for. You really can’t hear any age-determined lacks or errors. On the contrary, a guy like Paul Gilbert sounds even better than back in the day. On the downside of things, you’d have to be quite the fan to fully enjoy the wide spectrum of styles that is and has always been MR. BIG. You’d also have to love bass playing since Billy Sheehan seems to be all over this album. It’s a fun, life-loving positive album. I can’t wait to hear if they’re able to put all this ambition into new material. A special thumbs-up goes out to the bonus studio tracks (taken from old sessions) – great to hear some polished material after a LONG live album.